WHEN A TRUST IS BROKEN « THE BRYCE IS RIGHT! – What should you do? Forgive or reciprocate? There is perhaps nothing more demoralizing to the human spirit than discovering a broken trust. What makes this particularly painful is when a person believes another has his/her best interests in mind and will defend them. This can be between two friends, business associates, school, in sports, in politics, or even within families. Inevitably one or both parties are surprised, thereby creating resentment and a rift between people inevitably ensues. If a lie is discovered, a promise broken, cheating, not being treated fairly, playing politics, an insult, or whatever, it can do irreparable harm. You may forgive, but you will never forget and it is unlikely you will ever treat that person the same. We deal with such indiscretions in our own unique way, some through anger, some through humor, some through reciprocal action, or some simply ignore it. Frankly, I do not understand the latter alternative. 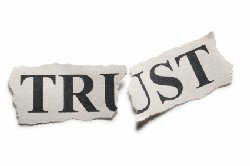 I realize some people may violate a trust simply to get nothing more than a reaction from a person, which is perhaps the worst reason for violating a trust. However, the violation is plain and simply an insult to your honor and should be dealt with accordingly. “Don’t get mad, get even.” I am not suggesting you stoop to the level of the person committing the indiscretion, but to simply return the favor more effectively than your antagonist. One way is to publicize the foul thereby discrediting the other person. Another is to report the person’s actions to the proper authorities, possibly even taking it to court. Aside from committing a similar foul to the other party, which I do not necessarily recommend, another option is to simply withdraw from the institution and leave the offender to his own devices. Understand this, by breaking the trust, the offender has already exhibited his feelings towards you. Forgive if you want, but the other person should instigate the healing process. Obviously, some things can never be forgiven. I had a friend from Brazil who moved to the United States and was surprised by our dependency on lawyers to solve numerous petty offenses. When I asked him how he would handle someone who had cheated him, he replied he would simply throw a brick through his company’s front window. He rationalized it would probably cost the company more to replace the window as opposed to paying him back. I’m not sure I would agree with his approach but I certainly can understand his sentiments. Whatever approach you use, first and foremost have confidence in yourself. Stand your ground and do not reduce yourself to the other person’s level. Some people go into a state of shock when the indiscretion initially occurs. They do not necessarily think clearly. Just simply take note of the facts involved with the situation, such as the time, date, place it occurred, and the people involved. Think through the problem, and devise a suitable solution. Regardless if it is forgiveness or retribution, consider the ramifications before deciding on a course of action. Samuel Clemons (Mark Twain) came up with an interesting approach for clearing out the riff-raft in his life; he sent an anonymous telegram to a dozen of his friends saying, “flee at once – all is discovered.” They all left town immediately. When someone breaks the trust, be sure to return the favor and do it with a little class. NEXT UP: DRAWING THE LINES – What the Nevada showdown teaches us about the future. LAST TIME: CELEBRATING THE MONTH OF MAY – One of my favorite months of the year. This entry was posted on May 5, 2014 at 6:00 am	and is filed under Social Issues. Tagged: Florida, palm harbor, The Bryce is Right, tim bryce, WHEN A TRUST IS BROKEN. You can follow any responses to this entry through the RSS 2.0 feed. You can leave a response, or trackback from your own site. Regardless of one’s approach to this situation (and, of course, that will vary with the circumstances), it seems to me that the most important standard to set for one’s own behavior is to act, as in all things, in a manner consistent with how you wish to be known by others. Invariably there will be some people who will see only how you, yourself, act: who will either not know or not care how you were wronged and who may have little interest for what may, in your own mind, justify your actions. Therefore, going forward, you may well establish your own reputation much more than spotlight that of the person who broke faith with you, when you decide how to respond. O K, that makes sense. We both belong to a group that holds harmony as one of its highest values and your statement, Tim, of getting even doesn’t seem to me to be your real thoughts. I have gone through a very serious conflict in the group I speak of, that, although it took months, ended in a very happy and amicable way putting us back as friends and Brothers. Was it worth the effort?… yes! Was it difficult?… yes! Was it trying?… yes! is it surviving the test of time?… yes! I am watching another scenario developing between two friends and knowing how long it will take to patch their “silly” rift am quietly suggesting they start as soon as possible… I don’t think that one would want to go to his grave with something like that left behind. The other, and maybe more disturbing, thing that occurs is that in a group or business these rifts cause people to take up sides and now you have your entire group or staff split in two… good luck sorting that one out. Winston Churchill and George Bernard Shaw were a long way from enemies… they loved challenging each other with their incredible and quick wits. There is an entire book relating “Winston Churchillisms” and they were directed to almost anybody he spoke to… he was kind of the Don Rickles of that time with the wise cracks… I have attended many dinners with his son Randolf who tended to emulate his father while speaking at “Commonwealth Dinners” throughout the British Commonwealth. Get these indiscretions repaired as quickly and harmlessly as possible, preferably before “mad” and “getting even” raise their ugly heads and ruin harmony.